Our grounds are open daily from sunrise to sunset. A self-guided tour is located in the parking lot kiosk; guided tours are offered by appointment. Picnic grounds available. No dogs please, $5 admission, free for members & children 12 and under. Help support our mission of plant research, education & conservation by becoming a Member or donating today. See our Programs for upcoming tours, talks, and classes. Sign Up for email updates on news and programs. The Polly Hill Arboretum, a Martha’s Vineyard horticultural and botanical landmark, was developed by the legendary horticulturist, Polly Hill (1907-2007). Here in 1958, Polly began an arboretum by sowing a seed, eventually bringing 20 acres under cultivation while preserving 40 additional acres as native woodland. Established in 1998 as a not-for-profit institution the Arboretum is devoted to the cultivation and study of plants and the preservation of the character and magic of this tranquil landscape. 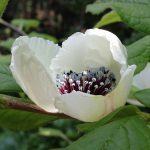 Rare trees and shrubs from around the world are set among stone walls, meadows, and fields, including Polly’s famous North Tisbury azaleas, the national stewartia collection, camellias, hollies, rhododendrons, crabapples, conifers, magnolias, and many more. The kousa dogwood allee, perennial border, monkey puzzle tree, and the Julian Hill magnolia are favorites with visitors. In 1850 Henry Whiting, a distinguished topographer and co-founder of the MV Agricultural Society, created a detailed map of the Vineyard. 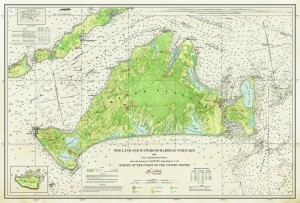 A new version of this historic map was developed by Dr. David Foster and associates at Harvard Forest and is available for purchase, with proceeds benefiting the Polly Hill Arboretum research fund. Informative brochure included. (22 x 32 unframed). 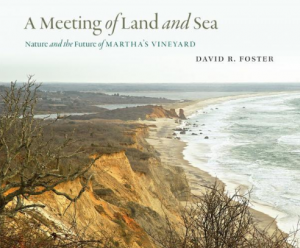 We congratulate PHA Research Associate Dr. David Foster on the publication of his new book, A Meeting of Land and Sea (Yale University Press, 2017). His book, available for purchase through Polly Hill Arboretum, looks at the dynamic interplay of natural and human impacts on forests over time on Martha’s Vineyard. Dr. Foster is Director of the Harvard Forest, a 3,000-acre ecological research site and one of the oldest and most intensively studied forests in North America. An eminent ecologist shows how an iconic New England island has been shaped by nature and human history, and how its beloved landscape can be protected. —via Yale University Press. (+$6.50 shipping and handling if mailed from PHA). Sales tax applies. 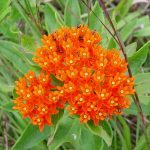 Need help finding the right plant for your landscape and site conditions? Check out our web-based searchable plant selection guide. Searches are based on site conditions, native region, plant type and plant characteristics. Each category has more detailed options, allowing your search to narrow down plant options for each location. Interested in West Tisbury weather information? Polly Hill Arboretum has its own weather sensor! Our sensor, which resides in the Arboretum’s north field, is located to maximize wind and rainfall accuracy. Latitude / Longitude: N 41 ° 23 ‘ 47 ”, W 70 ° 40 ‘ 39 ” Elevation: 33. Click to view our station on Weather Underground.